Steamy Fantasy: Congratulations, Mr. Darcy! Yay! Colin Firth is voted Britain's most attractive man. 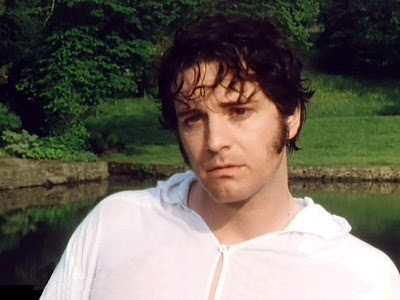 Firth, who played Jane Austen's hero Mr Darcy in the BBC's Pride & Prejudice, topped the poll ahead of second-placed actor Rupert Everett with Clive Owen and comic Russell Brand third and fourth. Around 1,500 women cast a vote in the poll which put Daniel Craig, who debuted as Bond in Casino Royale in 2006, in fifth place. Sir Sean Connery, who first played the part of Bond in Dr No in 1962, was voted ninth.